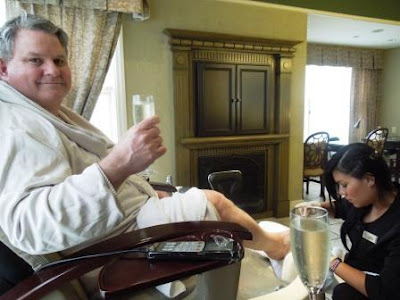 The World of Gord: My 58th Birthday at the Old Mill Spa! 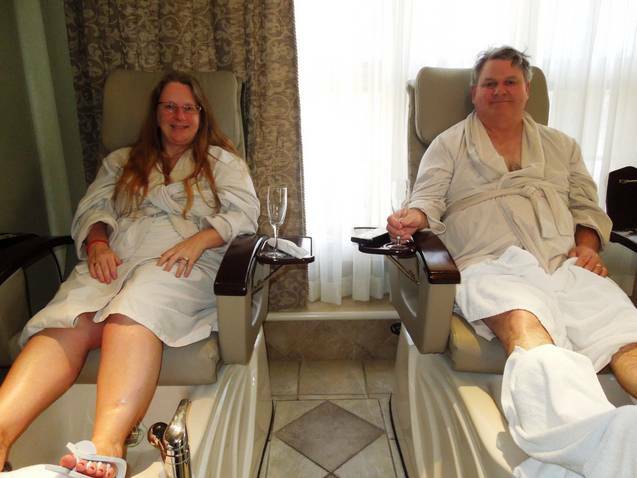 My 58th Birthday at the Old Mill Spa! Today is my birthday and to celebrate, Teena took me to the Old Mill Spa for a couple's massage and a chocolate peppermint pedicure. If you are a guy and say "what the hell? ", don't knock it 'til you try it. You sure don't know what you're missing. The Old Mill is on the site of two original mills. One was a lumber mill and the other a grist mill. In 1914, Robert Home Smith opened The Old Mill Tea Garden which became very popular with music and dancing and the Old Mill just expanded from there. It is a beautiful spot overlooking the Humber River. It felt very serene to me as we walked around the grounds. First up was the couple's massage. Teena had Belinda, who she loved and wanted to take home. I had Sarah, who also was great and, along with a great massage, showed me a couple of new stretches. It was a great hour that was over much too fast. Next up was the pedicure. If there is one regret we both had was that neither of us took a picture of my feet covered with the chocolate peppermint mask. It smelled great and was so cooling. Teena and I had side-by-side massage chairs. When I sat down, Ivette asked me if I would like a tea or coffee. I joked and asked for some bubbly. Turns out they are licensed so 2 glasses of bubbly came our way. Having someone working on you feet while enjoying a glass of bubbly is enjoyable, decadent and a fabulous way to spend a birthday. So relaxing too. Great idea Teena! It was a great time and we plan to go back again. Thank you for taking the time to let us know your comments about The Spa at The Old Mill Inn. We are committed to providing the highest level of customer service and your opinion is important to us. I am delighted to read we exceeded your expectations and hope to see you again soon!